Бильярд арена: 8 & 9 Ball Live Домино онлайн - десять разных домино игр Короткие Нарды Турнир онлайн угадай кто это! - Invite friends or play with random opponents. - Rematch option at the end of a match. - Game Center achievements and leader boards. - Option to switch board home position and swap color. - Text chat feature for all network games (Game Center, Local Network). Can be turned OFF. 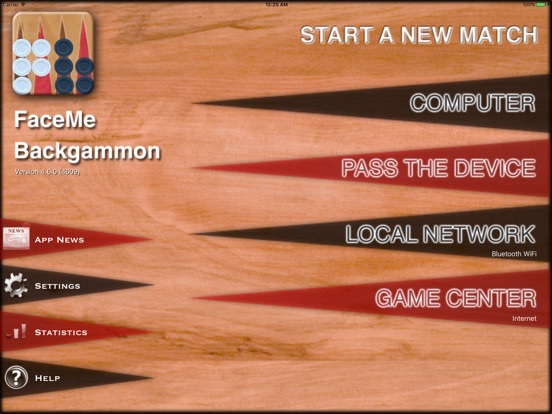 - Play a Local Network game (Bluetooth or Wi-Fi), against the computer, or a pass-the-device game. - Skill rating, won games, won match points and experience scores for completed Game Center matches. - Progressive undo, replay last move, PIP values, doubling cube, human powered random rolls. - Checkers are easy to select and move, with variable animation speed. - Optionally show all possible moves for any piece, or use "one-tap" moves. - Play 1, 3, 5 or unlimited-point matches. - Resignation with 1, 2, and 3-times multiplier. - Universal App: enhanced graphics for iPad and retina displays. - Neural Network based advanced computer algorithm. - Extensive settings screen allows users to customize their experience (see screen shots). 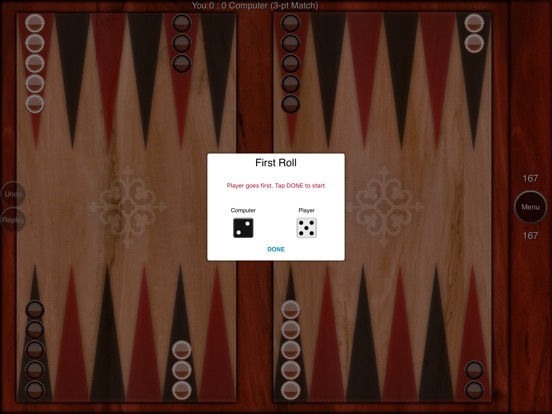 - Multiple dice rolling algorithms including web based rolls. - Statistics screen: tracks games won, points won, matches won, as well as dice roll statistics. - If the losing player disconnects from the game the winning player gets awarded the win. 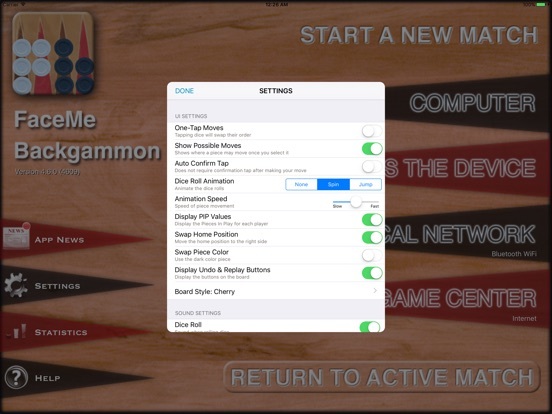 - 60-second time limit per move for Game Center Auto-Match games.